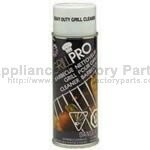 Grill & casting aerosol bbq cleaner. keep your grill clean with this environmentally friendly bbq specific cleaning product. the new improved formula will target those hard to clean spots, and zap away dirt & grime.